Bonds Up to 100000000 | Construction Bonds, Inc.
Who Should Apply for These Bonds? These bonds are for larger contractors with bonding experience. 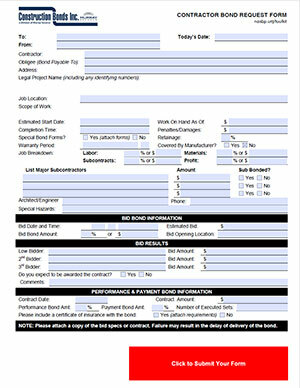 Below are the forms you will need to apply for a bond up to $100,000,000. Please note, additional information may be required as determined by our bonding representatives. Note: Adobe Acrobat is required to complete the forms and submit electronically. You may also print, complete in writing and send to us by email or fax to 703.934.1009. 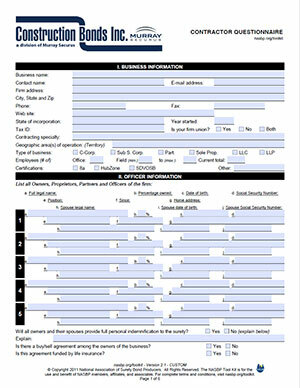 Once you filled out the above forms, please print them out and upload them on the Contractor Questionnaire below.